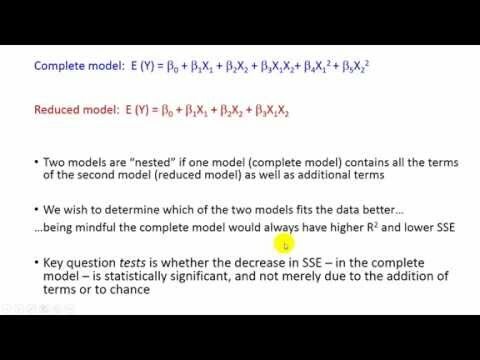 I need to compare the residual sum of squares in an unrestricted model with the residual sum of squares in a restricted model using an F-test to see if the additional independent terms in the unrestricted models significantly reduce the unexplained variations in the model. In the linked Youtube video, a guy shows how to do it manually (view the last 2 minutes or so) - however, I need to do it for a quite a few regressions, so it would be useful if there was a faster to do it in JMP. Uploaded by Pat Obi on 2015-02-19. Comparing the SSE for the full and reduced model could be pretty easy for lots of regressions depending on how your data is setup.